Monday through Friday, 8:00am-6:30pm. Daily check-in is at 8:00am for breakfast in the Ark, and daily check-out is at 6:30 after dinner in the Ark. Elementary Day Camp is filled with daily fun, learning, and adventure. 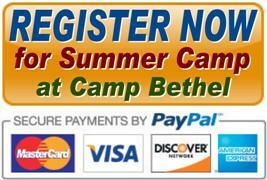 You will spend each day with your co-ed family-unit of 10-12 campers and 2-4 counselors. You and your unit will plan your week’s activities including swimming, group games, crafts, nature lessons, creek-play, parachute games, archery, climbing wall, orienteering, camping skills, group challenge & initiatives course, GaGa Ball & 9-Square,Bible study, daily group duties, daily “Voice Your Choice” Unit activity, hiking the camp trails and a singing-hike to Horseshoe Bend, polar bear swims, and hosting meals. For an additional fee, choose from one of the available "add-on" activities for your chosen dates, (see list and dates below). Be here for an awesome week! Subsidized Fee (discounted cost) = $350; Supporters Fee (Actual cost) = $400; Sustainers Fee (cost + $50 gift) = $450. Add-on activity pricing is below and will be billed to you separately from your Registration Fee. Week-long campers have the option to add River Tubing, Equestrian, or Horseback Riding, only one per week, and see below for when each is offered. If you are coming to camp with a friend or cabin mate, you do not have to choose the same optional activity. For example, Betty and Sharon can be in the same cabin/unit even though Betty is choosing Tubing and Sharon chooses no extra option.